Kenzie, our model this month, is a great illustration of transitioning our summer-wardrobe favorites into fall. The $5.99 brown floral dress from Kensie, (yes, I know coincidental right?) takes on an autumn feeling the way we’ve layered it with a Coldwater Creek denim jacket that was also $5.99. It had some great details and embellishments that add another element of fashion to the entire look. She’s also sporting some statement earrings ($2.99) and some oversized bangles ($6.99), as well as a great brown leather handbag for $3.99. The off-white wedge-soled shoes are the models own. Even though they’re a bit summery, the way it has all been put together says she is ready for a fun, and fashionable fall! Matt has got all the checks and balances covered in this casual, yet upscale look. 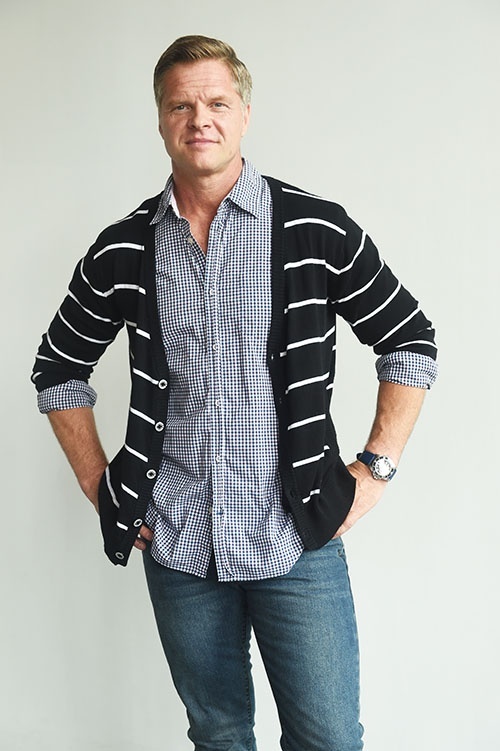 Working from monochromatic elements like the GAP button down shirt in black-and-white check ($4.99), topped with a black-and-white striped cardigan sweater from the SP Collection at $6.99, you see just how a strong style statement emerges. Goodwill is a great place to find denim like these Lands End jeans he’s wearing here—they were a great bargain at just $9.99. His accessories, like the watch and the brown workbooks, are his own, but I added in a brown vintage Aramis weekender bag ($12.99) that upped the fashion quotient in a big way. So, as you can see, basic elements + Goodwill prices equal timeless, masculine fashion!